Chicago-based artist, Anida Yoeu Ali, has launched a radical collaborative project utilizing art not just as a means to address critical issues but also as strategic intervention. The “1700% Project” implements a transdisciplinary artistic approach to educate a wider public about the dangers of racially-motivated fear and violence. The 1700% Project is titled after the exponential percentage increase of hate crimes against Arabs, Muslims and those perceived to be Arab or Muslim since the events of September 11, 2001. The project acknowledges that politically driven works are complex and layered thus often require a multitude of ways for expression and encounter. The 1700% Project is a multi-faceted project which currently includes a poem, video, audio recording and performance-installation. Each facet of the project implements a medium specific to the ways in which access operates within various communities. Each iteration of the text becomes its own unique work of art. The text, a performance poem by Ali titled “1700%” is a cento, 100 lines of found writings, based on filed reports of hate and bias crimes. The poem is Ali’s unapologetic response to injustices directed at the Muslim community. One component of the project includes a spoken word video based off the “1700%” poem. In this video, the artist and her team of collaborators seek participation from a range of Muslims. According to collaborator Masahiro Sugano, the video’s director, “These will be portraits of a range of Muslims who both fit and defy the image of “Muslim” in a post 9/11 world.” The video portraits depict Muslim individuals and families standing in front of the camera, with resilience and defiance. These are portraits of Muslims who refuse to be punished for their heritage, Muslims who refuse to feel ashamed of their faith. They are families who refuse to live in fear and they are people who refuse to end in violence. Sugano adds, “The premise of the 1700% Project leaves no choice but to be involved. The events of 9/11 have measurable, negative effects on the Muslim community and to be complacent is injustice not only to the Muslims, but to society in general. The idea behind the video is to challenge monological media-driven stereotypes of Muslims.” The video is due to be completed by April 23rd in time for the online video contest hosted by collaborating organizations: One Chicago, One Nation, IFYC, Link TV and IMAN. To vote for the 1700% Project, visit: Online Film Contest. From this belief, Ali built on the performance/installation component of the 1700% Project. The installation titled “1700% Project: Otherance” is based on a neologism Ali invented by combining the words, iteration, utterance and otherness. Ali’s definition of otherance is the repeated view and/or expression of perceived strangeness or difference. In her performance-installation, the text is exhibited as white vinyl letters against a white gallery wall. This “white on white” effect conveys the invisibility of these reported hate crimes and the violence of racial profiling. Activated through live performance, the text will be made more visible through the act of washing, staining and stenciling by a group of four performers. The performance of the text confronts issues of visibility/invisibility in relationship to the body, community, and historical memory. Ali created this component specifically for a gallery-viewing audience. The performance of “Otherance” will be held at Sullivan Gallery located at 33 S. State Street (7th floor) Chicago, IL on April 30th, 2010 from 8-10 p.m. The live performance will repeat at 7:30pm and 8:30pm. Ali and her team are finding creative ways to empower the community to feel ownership over the project. Every component has a title; each its own finished work of art with a way for various audiences to connect and contribute to the work. The 1700% Project provides an avenue that is relevant and accessible to the wide spectrum of Muslims and non-Muslims. The 1700% Project utilizes online social media—youtube, blog sites, and community forums to provide various connection points for the audience. Ali and her team recognizes this as an opportunity to present politically driven work in a multitude of ways that speaks to and with various communities; the multi-disciplinary approach (poem on the page, performance on a stage, installation on a wall, blog, youtube video) allows for thoughtful dialogue that is inclusive of the audience. Ali notes that it is crucial to connect today’s injustices experienced by Muslims to other historical moments driven by fear and hate mongering. “Art is a means to counter these attitudes because of its power to both provoke empathy and disseminate truths,” Ali comments. To read more about the collaborating artists, please visit the project’s blogsite. 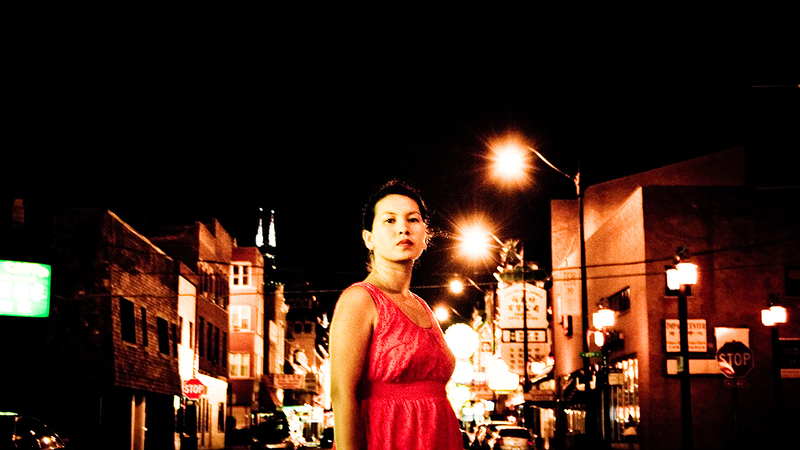 Anida Yoeu Ali is being honored with a tribute celebration, “Memory Into Flesh” by the Foundation for Asian American Independent Media for her achievements as an artist and activist at the Siskel Film Center on April 10th, 2010 from 6pm-7:30pm.